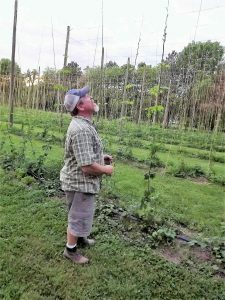 Jamie Arthur of Little Miami Farms of Spring Valley will highlight his farming operation which involves raising malting barley and hops along with his involvement with the craft beer industry at the Monday June 25 meeting of Greene Co. Farm Forum. In addition he will share some of the research ongoing at OSU and other universities related to plant breeding and the opportunities for raising malt barley and hops. The June 25 program starts at 6:30 p.m. with a meal and will be held at Union United Methodist Church located at 1145 Union Road, Xenia. The meal cost is $12/person and will be served prior to the program which starts around 7:15 p.m. Please RSVP Paul Ayres by Friday June 22 if you intend to have dinner. No reservations are necessary if you just wish to attend the meeting. For reservations contact Paul Ayres at 937-352-6379 or email him at payres1@woh.rr.com. The meeting is open to the public and sponsored by Greene Co. Farm Forum. Complete this short online form to indicate your acreage allocation interest: Click Here. If new to malting barley, attend the OSU Malting Barley Workshop on March 15th in Union County. For details: Click Here. Attend one of four grower meetings in March, see below for details.